Before I go any further... TERMINOLOGY! PARODY-ANIME = an anime adaptation of PARODY-MANGA, which is what I'm reviewing here. Parody-manga and parody-anime are theoretically the same. They have the same basic gags and the same characters doing mostly the same things. Characterisation has been exaggerated to the point of absurdity, so for instance Eren is a delusional nutcase who might reply to any question by vowing to exterminate all Titans. (They ate his cheeseburger.) He also delivers all his dialogue at maximum intensity, no matter how trivial. Mikasa is deadpan and follows around Eren at all times, being so obsessed that in his absence she'll turn into an depression generator and lose physical strength. Jean wants to attract girls, Oluo bites his tongue and collapses every time we see him, etc. One key difference is that for me everyone came alive better in the anime. I got the sense that they were students at school, whereas their manga equivalents felt more like one-dimensional flanderisations. Here, they have voice actors and we can see them running about. This makes a greater difference than you'd think. I could believe in them more easily. The school's more school-like. Similarly the characters' personal lives have been fleshed out a bit, albeit still in a piss-taking way. There's comedy romance, with two love triangles (Mikasa-Annie-Eren and Ymir-Krista-Reiner) and a couple of one-sided crushes bolted on to them. Jean keeps trying to be popular (which has a killer payoff in ep.6), Ymir keeps proposing to Krista and of course Hannah and Franz only exist to smother each other in pink hearts. At the same time, though, the parody-anime can make stronger and funnier references to its source-original than the parody-manga could. It's got the same voice cast. It's using the same music, be it funereal or death-or-glory. It can even rip off the title sequence, which is glorious. (I particularly love seeing the original Attack on Titan logo turning into "Titan Junior High School" in Japanese, but in BURNING STONE LETTERS SPLASHED WITH BLOOD.) The "next episode" previews have the same doom-laden tone as those of the source-anime, with no admission that this isn't life-or-death. Even things that the manga could have done are still clearer here. This anime has no anonymous supporting characters. Everyone is someone recognisable from the source-anime, drawn authentically except with their heads too big for their bodies. Similarly the characterisation has more nods to the original (e.g. "let's get married"). 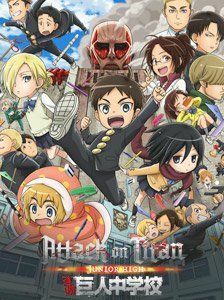 One oddity is that this isn't the first school-based anime parody of Attack on Titan. There was one on the DVD extras. It's called "Chibi Theatre: Fly, Cadets, Fly!" and there's one for every Season 1 episode. Each one lasts about 3-4 minutes and there are a dozen of them on disc 4 of the R2 DVD set. It's interesting to compare them. The pisstake characterisation is the same (especially Eren), but what's different is that Chibi Theatre is set in the regular Attack on Titan universe and every episode ends with everyone being eaten. This is amusing, but the Junior High titans are funnier because they don't eat people at all and instead conform to junior high school cliches... while still being titans. Well, except for Sawney and Beane. These are two old-school Titans that Hange keeps chained up even though they keep trying mindlessly to eat her. The logic behind this disparity is "because it's funny". 1. The title sequence, which always makes me smile. 2. Those idiots who even fail their make-up tests in ep.5 and go in refresher classes. 4. The way the haunted house in ep.8 really is all kinds of genuine freakazoid horror, even though the twist at the end pretends that almost all of it wasn't. 5. The delusional unsuitability of everyone in the student council election campaign in ep.10. 6. Eren the hot-blooded moron of morons (even by this show's standards), Jean the wannabe-Casanova and of course Deadpan Mikasa. (Eren tended to be the funniest thing about Chibi Theatre, for what it's worth.) Oh, and obviously the adorably mad Hange, who was the most entertaining character in the source-anime too. It's not an intellectual show. It's just a laugh. However I enjoyed it and it does its job. Since the manga's just finished, is there enough material for a Season 2?